Leather dyeing usually involves the use of spirit or alcohol based dyes where alcohol quickly gets absorbed into moistened leather. 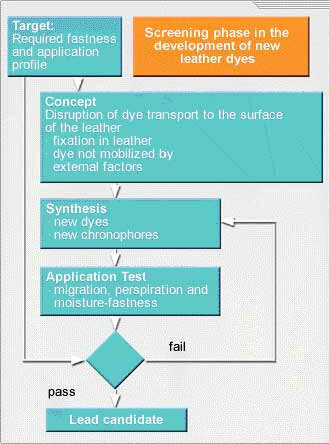 Leather dyeing formulations are similar to lacquers. They consist of a dye or pigment, a casein or nitrocellulose resin, and a solvent. The types of dyestuff that are used by tanneries generally varies depending on the product range needed along with the dictates of the fashion world. It is a fact that each tannery uses between 50-100 or more different types of dyestuffs. Basic Dyes, its use is also limited. Reactive dyes although a part of the anionic group of dyes but use limited to a certain extent. If we see from the chemical point of view the dyes used are mostly Azo dyes, Anthraquinone dyes and Triphenylmethane dyes. Commercially speaking, popular Black dyes account for nearly 60-70% of all leather dyeing. Also, out of this a dye variety called Acid Black 210 dominates with 80-90% usage of all of the black dyes used. Applying high temperatures releases the fat-soluble components of conventional leather dyes out of their chemical bonds. Now these components has a tendency to migrate upwards into the layers whose task is to give the smooth finish to leather surface. This causes a visible change of color and intensity. What happens is that with the rising of humidity, it is quite likely that non-permanent dyes that are water-soluble, and low in molecular weight, will be washed out. Along with the problems like spotting and discoloration. Also there is the risk that migrating dye components can rub off on other materials such as plastics or textiles. With latest technology of dyeing leather, the development and production of high-fastness dyes reached on top level. Now, the manufacturers get high quality leathers for making leather products.